A survey on maximal green sequences, preprint, April 2019, 15 pages, submitted to the proceedings of the ICRA 18, August 2018, Prague. With Marco Armenta: Derived invariance of the Tamarkin-Tsygan calculus of an algebra, preprint, November 2018, 7 pages. With Zheng Hua: Cluster categories and rational curves, 45 pages, preprint, September 2018, last modified on November 14, 2018. Singular Hochschild cohomology via the singularity category, 7 pages, preprint, September 2018, last modified on March 20, 2019. Erratum to "Deformed Calabi-Yau completions", 5 pages, preprint, September 2018. Derived categories, Contribution to the Encyclopedia in Algebra and Applications edited by Abdenacer Makhlouf, 30 pages, preprint, August 2018, last modified on August 6, 2018. A remark on a theorem by C. Amiot, preprint, June 2018, 3 pages. Appendix C to: Henning Krause, Completing perfect complexes, preprint, May 2018, 30 pages. With appendix A due to Tobias Barthel and appendix B due to Tobias Barthel and Henning Krause. Last modified on June 15, 2018. With Marco Armenta: Derived invariance of the cap product in Hochschild theory, preprint, November 2017, 4 pages. Last modified on November 5, 2017. Quiver mutation and combinatorial DT-invariants, corrected version of a contribution to the FPSAC 2013. Last modified on June 27, 2013. With Sarah Scherotzke: Desingularizations of quiver Grassmannians via graded quiver varieties, preprint, May 2013, 27 pages. Last modified on June 5, 2013. With Sarah Scherotzke: Graded quiver varieties and derived categories, preprint, March 2013, 39 pages. Last modified on March 10, 2013. Cluster algebras and cluster monomials, contribution to the proceedings of the European Congress of Mathematicians, Krakow, July 2012, 15 pages. With Giovanni Cerulli Irelli, Daniel Labardini-Fragoso and Pierre-Guy Plamondon: Linear independence of cluster monomials for skew-symmetric cluster algebras, preprint, 12 pages, March 2012. Last modified on March 12, 2012. Cluster algebras and derived categories, Introductory survey submitted to the Proceedings of the GCOE Conference Derived categories 2011 Tokyo. 60 pages. Last modified on February 18, 2012. Cluster algebras and cluster categories, Notes from introductory survey lectures given at the IPM in June 2008 and 2010. 30 pages. Last modified on October 13, 2011. On cluster theory and quantum dilogarithm identities, Notes from three survey lectures at the workshop of the ICRA XIV, Tokyo, August 2010. 32 pages. Last modified on July 6, 2011. With Sarah Scherotzke: The integral cluster category, Int Math Res Notices (2011) doi: 10.1093/imrn/rnr129. IMRN site. With Pedro Nicolás: Weight structures and simple dg modules for positive dg algebras, Int Math Res Notices (2012) doi: 10.1093/imrn/rns009. IMRN site. With Christof Geiss and Steffen Oppermann: n-Angulated categories, preprint, June 2010, 16 pages, to appear in Crelle's Journal. With Sarah Scherotzke: Linear recurrence relations for cluster variables of affine quivers, Adv. Math. 228 (2011), 1842-1862. With Rei Inoue, Osamu Iyama, Atsuo Kuniba and Tomoki Nakanishi: Periodicities of T and Y-systems, dilogarithm identities, and cluster algebras II: Types C_r, F_4, and G_2, preprint, January 2010, 37 pages, to appear in Publications of the RIMS, Kyoto University. With Rei Inoue, Osamu Iyama, Atsuo Kuniba and Tomoki Nakanishi: Periodicities of T and Y-systems, dilogarithm identities, and cluster algebras I: Type B_r, preprint, January 2010, 35 pages, to appear in Publications of the RIMS, Kyoto University. The periodicity conjecture for pairs of Dynkin diagrams, preprint, January 2010, last modified on April 14, 2012, to appear in Annals of Mathematics, volume 177, issue 1 (January 2013). Algèbres amassées et applications, Séminaire Bourbaki, Exposé 1014, novembre 2009, 27 pages. With an appendix by Michel Van den Bergh: Deformed Calabi-Yau completions, Journal für die Reine und Angewandte Mathematik (Crelle's Journal), 654 (2011), 125-180. Author's copy. Erratum. With Dong Yang: Derived equivalences from mutations of quivers with potential, Advances in Mathematics 226 (2011), 2118-2168. Author's copy. With Wendy Lowen and Pedro Nicolás Zaragoza: On the vanishing of some "derived" categories of curved dg algebras, preprint, May 2009, last modified on May 23, to appear in Journal of Pure and Applied Algebra. With Dong Yang and Guodong Zhou: The Hall algebra of a spherial object, Journal of the London Mathematical Society 2009; doi: 10.1112/jlms/jdp054. Cluster algebras, quiver representations and triangulated categories, submitted to the proceedings of the Workshop on Triangulated Categories (Leeds, 2006), preprint, July 2008, last modified on December 30, 2009. After Bernard Leclerc: Cluster algebras and quantum affine algebras, pdf, Oberwolfach report 5 (2008), 455-458. With Michel Van den Bergh and Daniel Murfet On two examples by Iyama and Yoshino (dvi 98 K), pdf (284 K), Compositio 147 (2011), 591-612. Categorification of acyclic cluster algebras: an introduction (dvi 82 K), pdf (269 K), preprint, November 2007, last modified on November 18. With Changjian Fu: On cluster algebras with coefficients and 2-Calabi-Yau categories (dvi 135 K), pdf (324 K), Trans. Amer. Math. Soc. 362 (2010), 859-895. Official offprint. With Dieter Happel and Idun Reiten: Bounded derived categories and repetitive algebras (dvi 143 K), pdf (289 K), Journal of Algebra, Volume 319, Issue 4, 15 February 2008, Pages 1611-1635. With Oleksandr Manzyuk: Equalizers in the category of cocomplete cocategories (dvi 66 K), ps (372 K), pdf (232 K), Journal of homotopy and related structures 2 (2007), 85-97. With Idun Reiten: Acyclic Calabi-Yau categories are cluster categories (dvi 84 K), with an appendix by Michel Van den Bergh, abstract, pdf (243 K), Compositio Mathematica, Volume 144, Issue 05, Sep 2008, pp 1332-1348. With Alberto Cattaneo, Charles Torossian and Alain Bruguières, Déformation, Quantification, Théorie de Lie, Panoramas et Synthèses 20 (2005), viii+186 pages, cf. also the EMALCA notes below. Appendix to a paper by Georges Maltsiniotis: Appendice : Le dérivateur triangulé associé à une catégorie exacte, Contemporary Mathematics, Volume 431, 2007, 369-373. With Idun Reiten: Acyclic Calabi-Yau categories are cluster categories (dvi 10 K), ps (551 K), pdf (342 K), Oberwolfach report, preprint, May 2006, last modified on May 15, 2006. On differential graded categories (dvi, 154 K), ps (551 K), abstract, pdf (342 K), preprint, January 2006, last modified on June 19, 2006. 23 pages. Appeared in: International Congress of Mathematicians. Vol. II, 151--190, Eur. Math. Soc., Zürich, 2006. A-infinity algebras, modules and functor categories (dvi, 141 K), abstract, ps (781 K), pdf (272 K), preprint, Contribution to the Proceedings of the workshop of the ICRA XI (Querétaro, México, 2004), October 2005, last modified on April 4, 2006, 28 pages. With P. Caldero: From triangulated categories to cluster algebras II (dvi, 116 K), abstract, ps (289 K), pdf (475 K), preprint, October 2005, last modified on April 12, 2006, 23 pages. Appeared in Ann. Sci. École Norm. Sup. (4) 39 (2006), no. 6, 983-1009. With P. Caldero: From triangulated categories to cluster algebras (dvi, 176 K), abstract, ps (600 K), pdf (367 K), Inv. Math. 172 (2008), 169-211. On triangulated orbit categories, Documenta Math. 10 (2005), 551-581. Available at Documenta Mathematica, Band 10, Corrections. Derived categories and tilting (dvi 243 K, without the final figure), abstract, pdf (418 K), January 2004, last modified on June 13, 2010. Derived invariance of higher structures on the Hochschild complex (pdf 248 K), abstract, postscript (432 K), August 2003, last modified on May 16, 2018. Joint with Amnon Neeman: The Connection Between May's Axioms for a Triangulated Tensor Product and Happel's Description of the Derived Category of the Quiver D_4, Doc. Math. J. DMV 7 (2002), 535-560. Available at Documenta Mathematica, Band 7. Hochschild cohomology and derived Picard groups (dvi 73 K), abstract, Journal of Pure and Applied Algebra, 190 (2004), 177-196, postscript (413 K), pdf (249 K), last modified on September 25, 2003. Notes on minimal models (220 K), unpublished notes, January 2003. A-infinity algebras in representation theory (dvi 48 K), Contribution to the Proceedings of ICRA IX, Beijing 2000, abstract, postscript (188 K), last modified on July 4, 2001. Bimodule complexes via strong homotopy actions, Algebras and Representation theory, Vol. 3, 2000, 357-376, abstract, postscript (379 K). Failure of Brown representability in derived categories, joint with Dan Christensen and Amnon Neeman, Topology, 40 (6) (2001), 1339-1361. abstract, postscript (193 K). Introduction to A-infinity algebras and modules and Addendum (dvi 128 K, no figures! ), Homology, Homotopy and Applications 3 (2001), 1-35. abstract, postscript and Addendum (427 K, includes figures). On the cyclic homology of ringed spaces and schemes (pdf, 270 K), Doc. Math. J. DMV 3 (1998), 231-259. Available at Documenta Mathematica, Band 3. On the cyclic homology of exact categories (pdf 435 K), Journal of Pure and Applied Algebra 136 (1999), 1-56, abstract, postscript (380 K) corrections, ps. Derived categories and their uses (dvi 111 K), Chapter of the Handbook of algebra, Vol. 1, edited by M. Hazewinkel, Elsevier 1996. postscript (254 K), pdf (234 K). Basculement et homologie cyclique (dvi 74 K), Exposé de synthèse donné au Colloque du Contact Franco-Belge, Reims, Juin 1995. abstract, postscript (160 K). Invariance and Localization for Cyclic Homology of DG algebras (pdf 387 K), Journal of Pure and Applied Algebra, 123 (1998), 223-273. abstract. On the construction of triangle equivalences (dvi 92 K), Contribution to S. König, A. Zimmermann, Derived equivalences of group rings, Lecture notes in Mathematics 1685, Springer, Berlin, Heidelberg, 1998. (expanded notes of a series of 3 lectures at a Summer School in Pappenheim, Bavaria). abstract, postscript (194 K), pdf (192 K). A remark on the generalized smashing conjecture (dvi 18 K), Manuscripta Mathematica 84 (1994), 193-198, abstract. postscript (200 K), pdf (117 K). Deriving DG categories (dvi 155 K), Ann. Scient. Ec. Norm. Sup. 27 (1994), 63 - 102. abstract. postscript (319 K), pdf (331 K), corrections, ps, Resolutions of dg modules. Derived categories and universal problems (dvi 161 K), Communications in Algebra 19 (1991), 699-747. pdf (288 K). Chain complexes and stable categories (dvi 158 K), Manuscripta Mathematica 67 (1990), 379-417. pdf (243 K). Joint with D. Vossieck: Aisles in derived categories (dvi 63 K), Bull. Soc. Math. Belg. 40 (1988), 239-253. abstract. postscript (279 K), pdf (156 K). Joint with D. Vossieck: Dualité de Grothendieck-Roos et basculement (dvi 29 K), C. R. Acad. Sci. Paris 307 (1988), 543-546. abstract. postscript (203 K), pdf (116 K). English version: Grothendieck-Roos duality and tilting (dvi 28 K), abstract. postscript (203 K), pdf (117 K). Joint with D. Vossieck: Sous les catégories dérivées (scanned pdf 266 K), C. R. Acad. Sci. Paris 305 (1987), 225-228. abstract. Quiver varieties and derived categories, talk at the conference on Cluster Algebras in Combinatorics, Algebra, and Geometry, MSRI, October 29, 2012. Quiver representations and cluster algebras, lecture series at the MSRI, August 28-30, 2012: Lecture 1, Lecture 2, Lecture 3. Carquois ? Suivez la flèche !, vidéo d'un exposé au séminaire "Enseignement des mathématiques", 9 novembre 2011. Quantum dilogarithms and quantum cluster algebras, video of a talk at the Banff International Research Station, September 5, 2011. Quantum dilogarithm identities from quiver mutations, video of a talk given at Banff, September 9, 2010. An application of triangulated categories to cluster combinatorics, video of a talk given at Leicester, November 3, 2009. Mutations of quivers with potentials and derived equivalences, video of a talk given at MSRI, April 2, 2008. 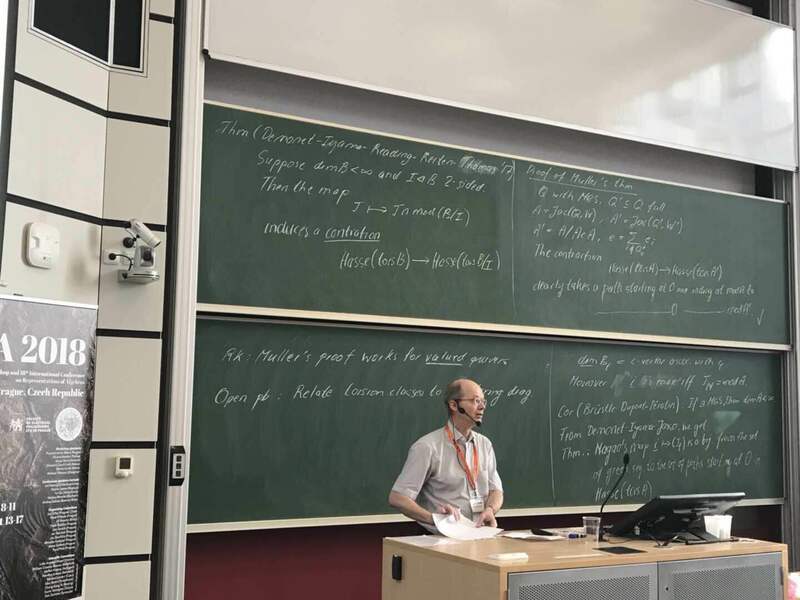 On green sequences, slightly expanded beamer version of a blackboard talk at the ICRA 2018, Prague, August 13, 2018. Des récurrences aux algèbres amassées, presentation, Journée en l'honneur de Rached Mneimné, Paris, December 18, 2017. Quiver mutation and combinatorial DT-invariants, presentation, FPSAC 2013, Paris, June 25, 2013. Cluster algebras and applications, presentation, meeting of the Germany Mathematical Society, Cologne, September 22, 2011. Quiver mutations and quantum dilogarithm identities, presentation, Isle of Skye, June 27, 2011. Quiver mutation and derived equivalence, presentation, Amsterdam (5ECM, July 2008). On differential graded categories, presentation, Madrid (August 06), Valladolid (August 06). A characterization of cluster categories, presentation, Leeds (August 06), Granada (September 06), Boston (September 07, includes example based on quiver mutation). Three small triangulated categories, javaview illustrations. Root systems of type A3, B3 and C3, javaview illlustrations. Quiver mutation, java program which implements Fomin-Zelevinsky's mutation rules for quivers, cluster variables and denominator vectors. Cristal 1.9, a Macintosh program for drawing periodic motives in the plane, made in 1994 for system 7. Cluster algebras and quiver representations (dvi, 36K), pdf (173 K), extended abstract and references for a minicourse given at the 2006 Summer School of the International Research Training Group Metz-Paderborn. A brief introduction to A-infinity algebras (pdf 134 K), Notes of a 90-minute talk given at the Workshop on Derived Categories, Quivers and Strings, 2 to 6 August 2004, Edinburgh, 7 pages, last modified in October 2004. Notes on minimal models, preprint, 2003, 4 pages. Koszul duality and coderived categories (after K. Lefèvre), (dvi 23 K), abstract, postscript (290 K), pdf (176 K), October 2, 2003, last modified on April 4, 2006. Introduction to Kontsevich's quantization theorem, Notes covering the material of a minicourse given at the EMALCA III, Morelia (México), August 2003. Version of January 28, 2004. pdf file (444 K), ps file (1515 K), ps.gz file (767 K). Bernhard Keller, le 10 septembre 2006.